Making matzo at home brings with it an unusual challenge: because the goal of eating matzo is to remember the sacrifices our forebears made, it’s not really supposed to be enjoyable. Store-bought matzo, if made appropriately, should leave one with the approximate sensation of having eaten crisp cardboard made out of dust. It’s shattery. It’s white. And it’s very, very plain. The problem is, I usually avoid boxed matzo. I don’t steer clear because of the taste. I skip it because it’s just the type of white-flour product—plain, slightly sweet, and likely quite processed—that makes me feel crummy. Gluten-free matzo are commercially available, but they’re heinously expensive. And unlike regular boxed matzo, which often come in various flavors, gluten-free matzo are (in stores near me) always naked. 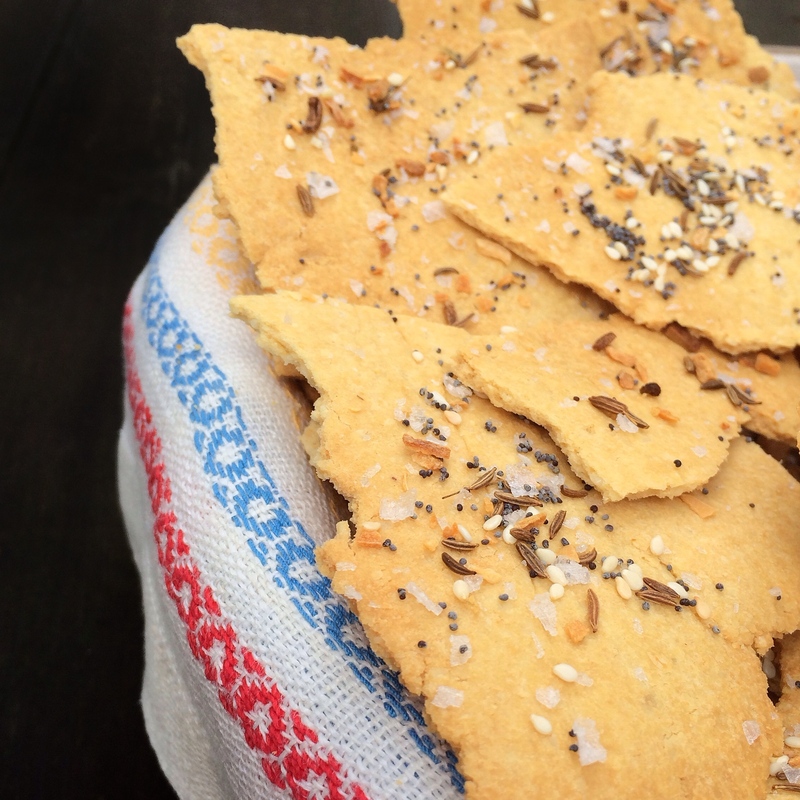 I lined up my matzo musts: First, I wanted my crackers to taste like an everything bagel, with a smattering of seeds. Second, I wanted to avoid grains, lest someone question my devotion to Ashkenazi Judaism (to which I am not even slightly devoted), practitioners of which typically avoid all grains during the holiday. Third, the matzo had to be disappointing in some way. There’s no point in making a cracker that doesn’t taste like suffering if you’re going to eat it for a week straight while pretending to suffer. I couldn’t call it matzo if it didn’t leave me needing a glass of wine, or at the very least, water. “This can’t be called matzo,” said J, a high school friend who’s recently moved to Seattle. “It tastes too good.” She was munching on a cracker I’d made from a mixture of almond, coconut, and garbanzo bean flours—a mixture sprinkled with poppy, sesame, and caraway seed, crunchy sea salt, and dried onion flakes, then baked until the edges curled up. 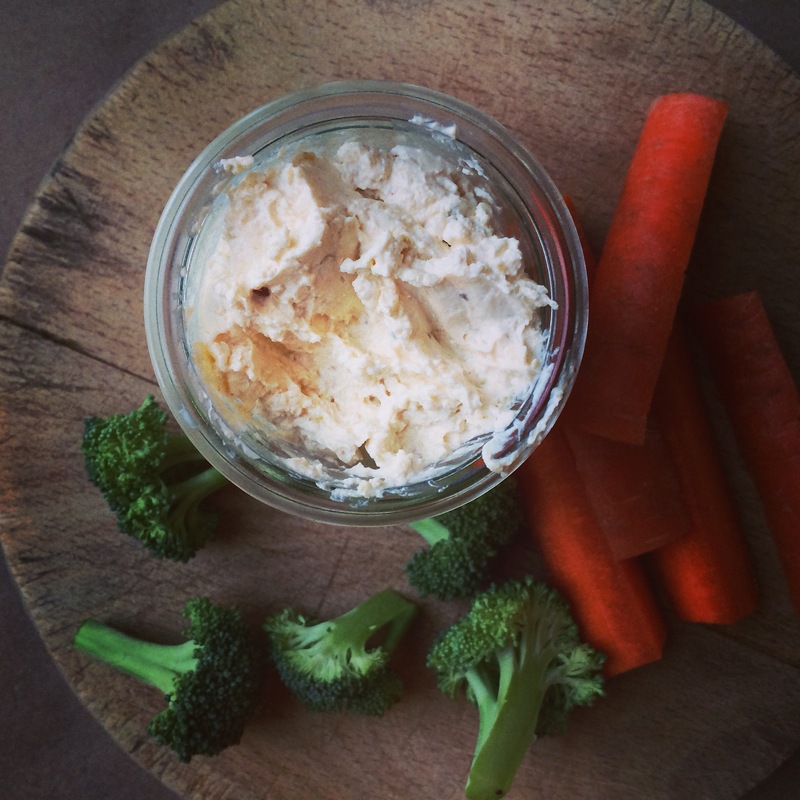 We dipped the crackers in hummus, pondered, and ate more. “I’m no expert, but there is no way these are matzo,” she repeated. She was right. I wasn’t feeling even the least bit guilty about having a nice life, or peaceful surroundings, or leavened bread–not to mention making a cracker that took longer than the “official” limit of 18 minutes to make. I was feeling guilty about planning to not eat the same terrible cardboard everyone else planned on eating. “They’re a cross between socca and a graham cracker,” declared Jim. And he was right. We actually enjoyed them. The next day in the car, I started preparing Graham for what will probably be the first Passover dinner he will actually understand. I talked about how Jewish people take the holiday as a moment to slow down and appreciate what they have. About how we eat certain foods to celebrate the season, and how we always leave the door open, in part to welcome in anyone who might stop by with a hungry stomach. “Mom, what does ‘Jewish’ mean?” he asked. Right. I’d forgotten the basics. I’m a secular Jew: I’m Jewish by tradition and by generational duty, but not by proactive practice. We don’t talk very much about religion in our house. “Jewish means something different to everyone,” I said carefully. I went on to give a very brief, very bad explanation of how religions differ, and how everyone needs to find out for themselves what practice works best for them, if any. Our conversation fizzled, and I cursed myself for being so unprepared. Then, when we got home, I got an idea. He refused to taste it. And in that moment—feeling guilty for giving the matzo too much flavor, and for failing to teach my son about my family’s past practices, and for realizing he had zero concept of what was going to happen later in the week at Passover dinner—I realized I could call it matzo. I’d suffered enough. Eat it smeared with additional guilt. 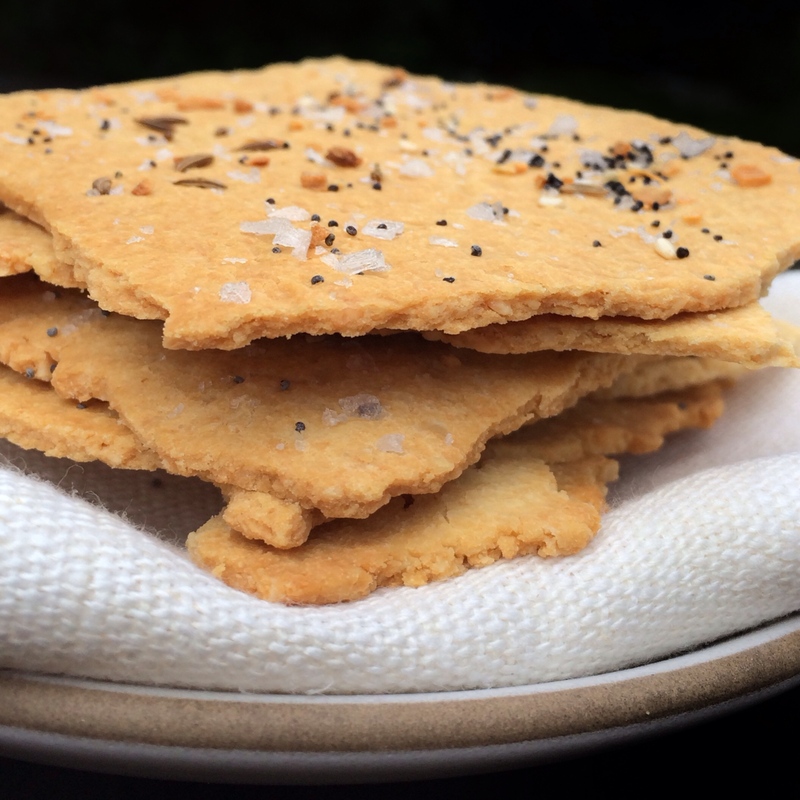 Made with a combination of garbanzo, almond, and coconut flours, these crackers have a texture slightly crisper than graham crackers, with a much more savory flavor. Topped with a smattering of the seeds you might find on an everything bagel—plus caraway, a favorite of mine—they make a good substitute for any cracker you’d use for hummus, cheese, or tuna salad. Put them on the Passover plate, if you feel like it—but be warned that they’re more flavorful than traditional matzo! Look for minced dried onion in the spice section of your local grocery store. In a small bowl, blend the poppy, sesame, and caraway seed with the onion and sea salt with a spoon until well mixed. Set aside. In the work bowl of a stand mixer fitted with the paddle attachment, stir together the potato starch, coconut flour, almond flour, garbanzo bean flour, baking soda, baking powder, and kosher salt just to blend. With the machine on low speed, add the oil, water, and egg. 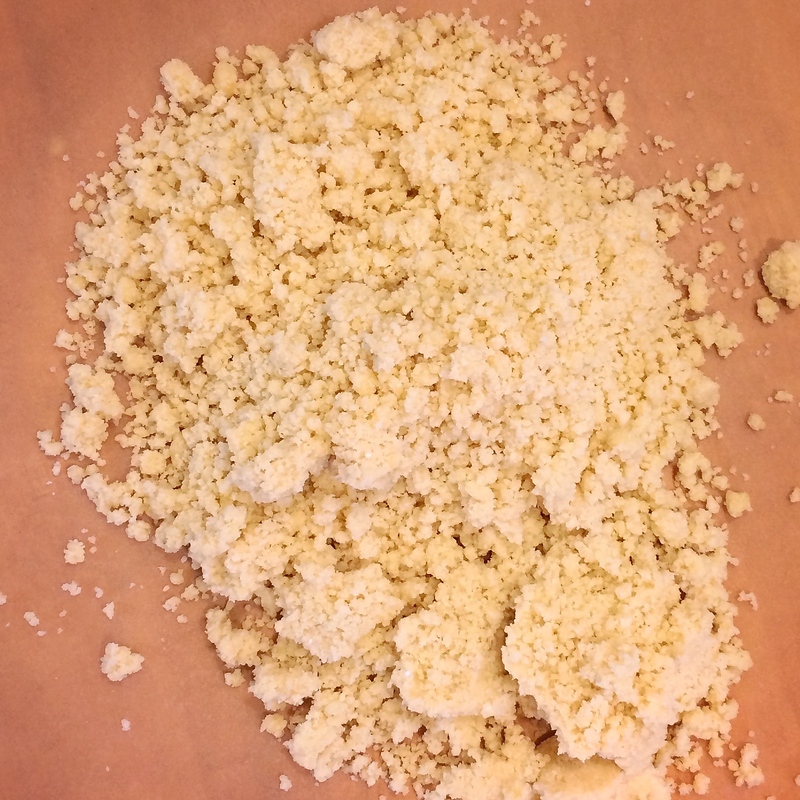 Increase speed to medium and blend for one minute, until crumbly. The mixture should clump together when you press a handful between your palm and fingers. Brush one baking sheet with olive oil. Peel the top sheet of parchment off the rolled-out dough, then carefully invert the dough onto the prepared baking sheet, paper side up. Peel off the remaining piece of paper, and brush the dough with more olive oil. Bake the matzo for 5 minutes. Rotate the pans front to back and top to bottom, and bake another 5 to 7 minutes, or until the matzo is well browned on all edges and begins to curl up and off the pan. Transfer the crackers immediately to cooling racks and let cool for at least 30 minutes before breaking into pieces and serving. 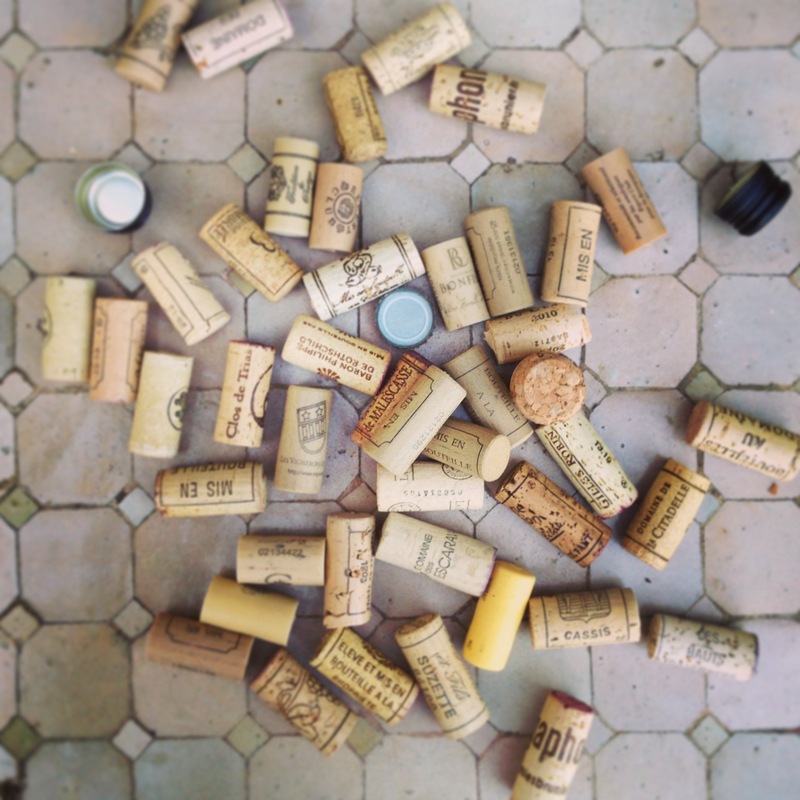 Store any unused crackers in an airtight container, up to 3 days. If you’ve followed the Uncle Josh Haggadah Project over the last five years, never fear, there is a 2015 edition. This year, it focuses on Montana, and was written in conjunction with our sister. Click here for the PDF of the 2015 Haggadah. 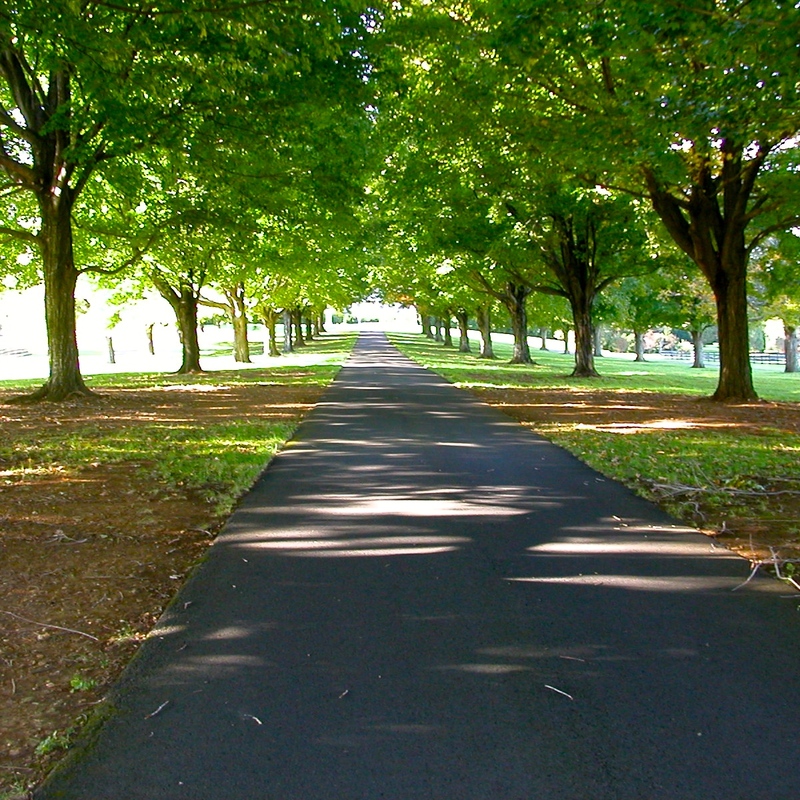 The first time I flew into Regan National Airport in Washington, D.C., I think, was ten years ago. At the time, I was a personal chef—a private cook to people ranging, in order of preference, from devout foodlovers looking for a bit of a break on their summer vacation, to people looking for a more creative take on catering for larger parties, to heiresses looking (as far as I could tell) to flaunt their wealth to their Hyannis counterparts. I think I did the job right. I organized everything through her personal assistant, because the Princess was allergic to email. I made the boring orzo salad she loved for her to have for lunch the next day, with the olives I had to order from Peru. (Maybe it was Argentina? I’ve blocked them out.) I scrubbed the Sunkist stamps off lemons in advance when I couldn’t find her required organic ones, and I smiled and presented the meal when I was supposed to in my pompous chef’s jacket, and in general, despite her difficulty, I really did enjoy it all. It was virtual reality—one in which I could buy whatever I wanted, at whatever cost, save the wine, which she limited to $20 per bottle. And she apparently enjoyed having me, because a few times, she paid me handsomely to fly down to her place in Virginia to cater a weekend’s worth of meals for her 25 or so closest friends. The thing I remember most strongly, though, are her refrigerators. In the kitchen—a space roughly the size of my home’s current upstairs, fitted with a ten-person mahogany table in the center that we had to meander around each time we had to use the sink, oven, refrigerator, or trash can, which is to say, often—there was a bank of clear-doored Sub-Zeroes whose shelves’ square footage approximated that of a small grocery store’s. When I FedExed the pumpkin ravioli from Citarella that the Princess had to have from New York, it didn’t fit into her refrigerator plan. There was the place for milk and the place for fruit and the place for the grandchildrens’ food and the place for premade snacks, but there was no place for meat, or anything remotely “unsightly.” The ravioli were orphaned. Downstairs, in the so-called slave kitchen—the Princess always whispered the word “slave”—there was also a walk-in refrigerator, which is where the ravioli ended up, on top of the duck breasts. One time, when my friend Michaela and I had been in Virigina long enough to get good and tired, we snuck down to the walk-in. We rested on the concrete floor with our feet elevated and drank Cokes. We iced our foreheads with the ravioli and made fun of her porcelain chicken collection. Each time her gaggle of guests prepared to leave, the Princess hosted a lunch in what she called The Palm Room, which was a grand lobby-esque space not unlike the dining room in The Plaza Hotel near Central Park. (There were weird monkey statues everywhere, for some reason.) We made platters and platters of tea sandwiches, and salads, and deviled eggs, and lavender shortbread. Once, at the last minute, the Princess announced she wanted to add a lentil salad to the lunch menu. I’d grown accustomed to her weird whims—if you want to plop a Maryland crab cake into that potato soup, lady, you go for it—but we had no lentils, and it was nearing noon, and the plantation was thirty minutes from anything. I said no. She pouted the rest of the day. Since then, when I make anything with lentils, I think of Priscilla Princess. I think of the way she could somehow say my name with a Southern accent, rising in pitch and volume every time. “JaaayyyyUUSSSS?” she’d start, sugary sweet. “Just a quick question. Would you mind making that osso buco on the old stove on Saturday, when we have dinner in the blue house? I know it doesn’t really work, but it’s so pretty, and I’d love for the guests to get a feeling for how it was to cook a century ago.” I think of how sorry I felt for her sometimes, when I realized that the stress of not having the pillowcases in all twenty-something rooms match the patterns popular in the 1700s (when the estate was built) was actually causing her physical discomfort. And I think of how sad it was, and probably still is, that she liked really boring food. And so here I am now, flying into Reagan again, this time for a conference, where no one will tell me how to wash my hands or how many lemon thyme sprigs are required on each plate—with a lentil salad on my tray. It’s an asparagus and pea version from home, and it’s spilling herbal perfumes into the seat beside me in a way that makes me feel like I’m getting back at my neighbor for taking up more than his paid share of the plane. We are bumping over Chicago (something that always seems odd to me when the sky is clear, despite my vague awareness of airflow science). I’m thankful I’ve made the salad a second time, so I don’t find myself lunching on a bag of beef jerky and stale nuts. I’m thankful that I don’t have an orchidist, or work for a person who feels she needs one. And I’m thankful that life has taken me to a place where I make lentil salad when and where and how I want, with ingredients from a refrigerator that is always too full and an herb garden that, despite total neglect, actually grows something useful. In hindsight, this salad looks like the offspring that might result from a debaucherous night involving the lentil salad and the raw asparagus salad in A Boat, a Whale and a Walrus, but it wasn’t intended to mimic either. It’s a result of two things: first, the need for a lighter meal before a bike ride, and second, the green riches springing forth from my garden in the forms of parsley, chives, and mint. Serve it as is, with a few things alongside, or pile it onto steamed brown rice, like we did, for more of a complete meal. I used the nettle pesto I make every spring, but basil pesto (even a good jarred version) will work nicely. Serves 4 with rice, or 6 to 8 as a salad. In a large saucepan, heat the water to a boil. Add the lentils and cook at a simmer, stirring occasionally, for about 30 minutes, or until tender. While the lentils cook, in a small bowl, whisk together the lemon juice, apple cider vinegar, and 7 tablespoons olive oil to blend, adding salt as necessary. (Keep in mind that lentils like a lot of salt.) Set the dressing aside. Heat a large saucepan over medium-high heat. Add the remaining tablespoon olive oil, swirl to coat the pan, then add the asparagus and peas. Cook, stirring occasionally, for 3 to 5 minutes, or until the vegetables are bright green and slightly charred in spots. Transfer the greens to a big platter to cool. When the lentils are cooked, drain them in a fine-mesh strainer, then transfer them back to the warm pot. Add the dressing, stir gently to combine, then stir in the mint, parsley, and chives, reserving a few pinches of each for the top of the salad, if desired. 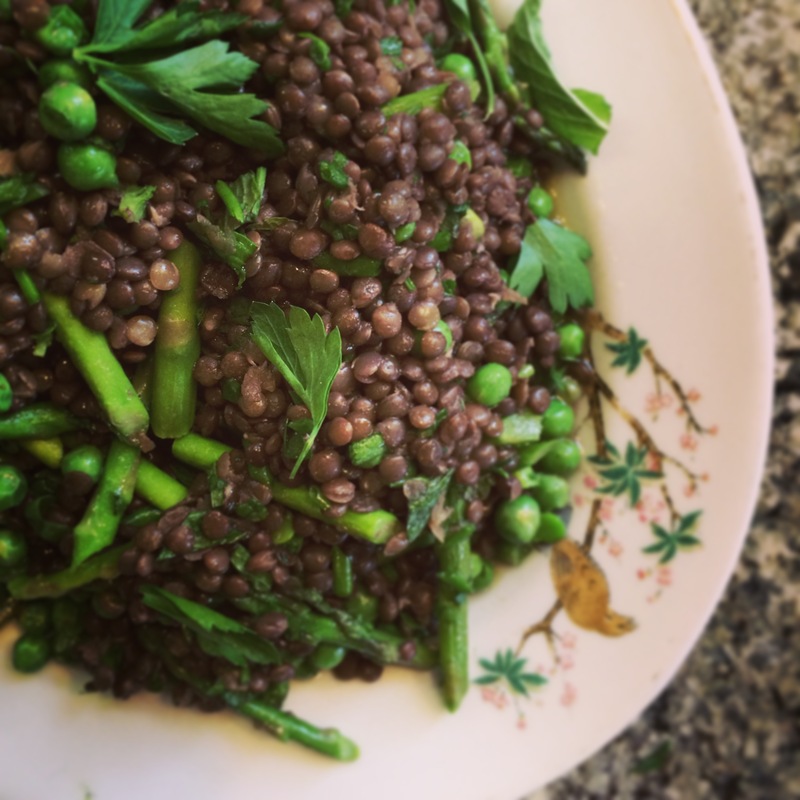 Add the asparagus and peas to the lentil combination, stir a few times, then heap the salad back onto the big platter. Serve the salad warm or at room temperature, drizzled with additional olive oil and garnished with extra herbs and crunchy sea salt. You’ll hear, certainly from more dramatic writers, that working on a memoir is like childbirth: It’s painful. It takes too long. It shows you the part of yourself you never wanted to see. Technically, A Year Right Here—the series of essays flowering into form on my computer these days, in fits and starts—is not a memoir. But it is, in general, about me. And I find it is, in general, a more difficult process than writing cookbooks has been. But for me, the process of writing a single essay is more akin to laying an egg. I can’t say why or when or how, but at certain times, my mind is capable of producing writing. When I feel the egg coming on, I find a nest—often Vif, the coffee shop in Seattle’s Fremont neighborhood whose breakfast menu typically refuels me late morning if I’m really on a roll—and I write. When the essay comes out, it’s almost fully formed, save some tinkering. It’s a matter of washing and perhaps scrubbing, but usually not one of constructing. But if there’s no egg, there’s no writing. If there’s no egg, I answer email or plan or pitch or simply walk away. And so it happened that the other day, when I realized my cozy spot in the sun at Vif wasn’t going to be productive in any way, I gathered my dog and my mittens and my favorite orange bag and went for a walk in Discovery Park. If you ask a park ranger, I’m sure she would tell you that picking foods out of Disco Park, as we call it, is strictly illegal. But as spring unfolds into summer and summer unfolds into fall, it’s not unusual to see folks picking things out of the undergrowth or off spiky blackberry bushes. And this year, the nettles are early. And on the whole, I do very few things that could land me in jail, so I figured picking was worth the risk. Stinging nettles, as they’re so accurately named, are what I once called mint’s mafia cousin; they have spade-shaped leaves with toothy edges, but they’re corrupted by a taste for causing pain. Cooked and whirled up into, say, a pesto, the fine stinging hairs on the sunny side of each leaf learn to play nice, but if you touch them when the leaves are raw—i.e., when they’re still in the ground at Disco Park, or fresh out of the bag from the farmers’ market—they will cause paresthesia, which is a (temporary) numbing or stinging wherever the hairs contact your skin. I’ve learned, over the years, that it’s best to dump fresh nettles into a pot of boiling water, dirt and sticks and bugs and all. The less desirable stuff tends to float up to the surface, where it can be fished out with a slotted spoon, and I don’t get stung. But before this week, I’d never picked nettles myself. It’s not hard. It took almost as much time to put on my mittens as it did to pluck a bag’s worth of nettles in a spot just out of view of the park’s walking trails—maybe five minutes, at the most. I simmered them until they were limp but still bright green, then buzzed them into a thick paste, along with strips of lemon zest, toasted walnuts, and olive oil. 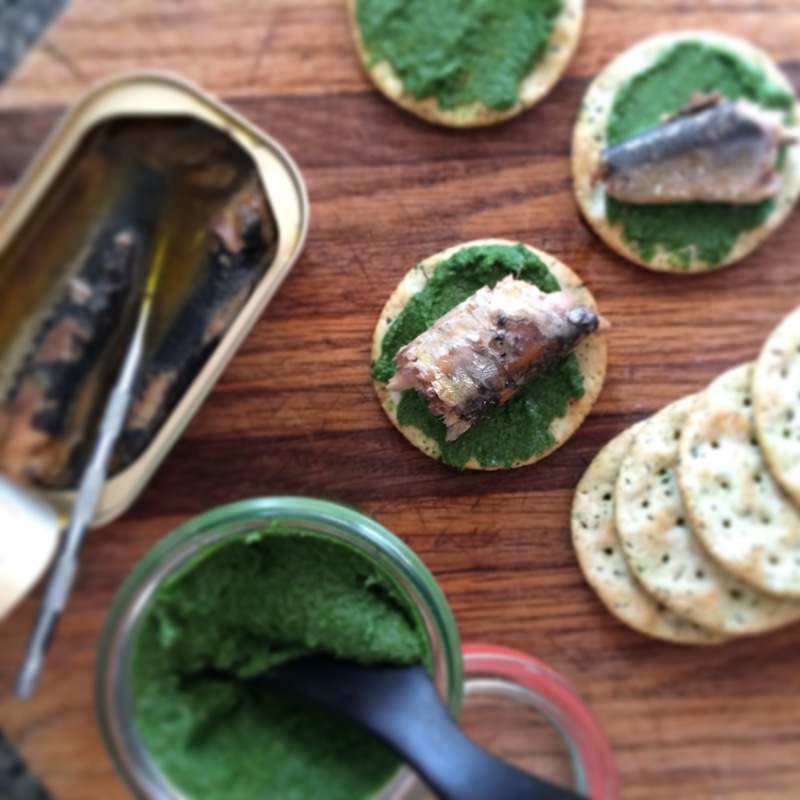 Yesterday, I smeared the nettle-walnut butter onto crackers and topped it with tinned sardines for lunch, and for dinner, I mixed it with olive oil and tossed it with pasta. Today, I’ll bring half of it in a small jar to the ladies at Tieton Farm and Creamery, who I’m visiting for the book. Maybe we’ll have it for breakfast, over eggs, with a smattering of fresh cheese. First, though, I’m going back to the park, because it’s sunny and because there are nettles and because some days, there is just no egg. This recipe calls for six ounces of fresh stinging nettles, but if you’ve dealt with nettles before, you know that measuring them—well, touching them in any way, really—is inconvenient, because the fine hairs on the sunny side of each leaf really do sting. 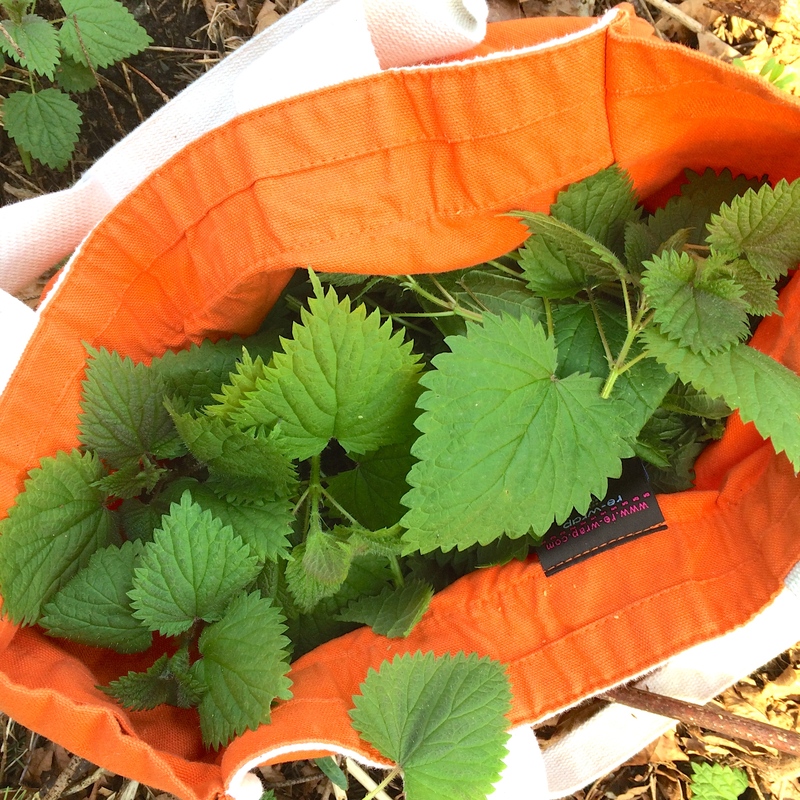 Six ounces is about half a paper bag’s worth of unpacked nettles, if you’re picking them yourself. Use the spread on sandwiches, smear it on a plate and top it with cooked eggs and crunchy sea salt, or dilute it a bit with water and dress a bowl of spaghetti (with additional chopped walnuts, toasted breadcrumbs, and freshly grated Parmesan, if you’re willing). Heat a large pot of water to a boil over high heat. Add the nettles without touching them, using tongs if necessary, and cook for 5 minutes, stirring occasionally, or until the nettles are all completely limp. Drain the nettles, spread on a baking sheet, and set aside until cool enough to touch. 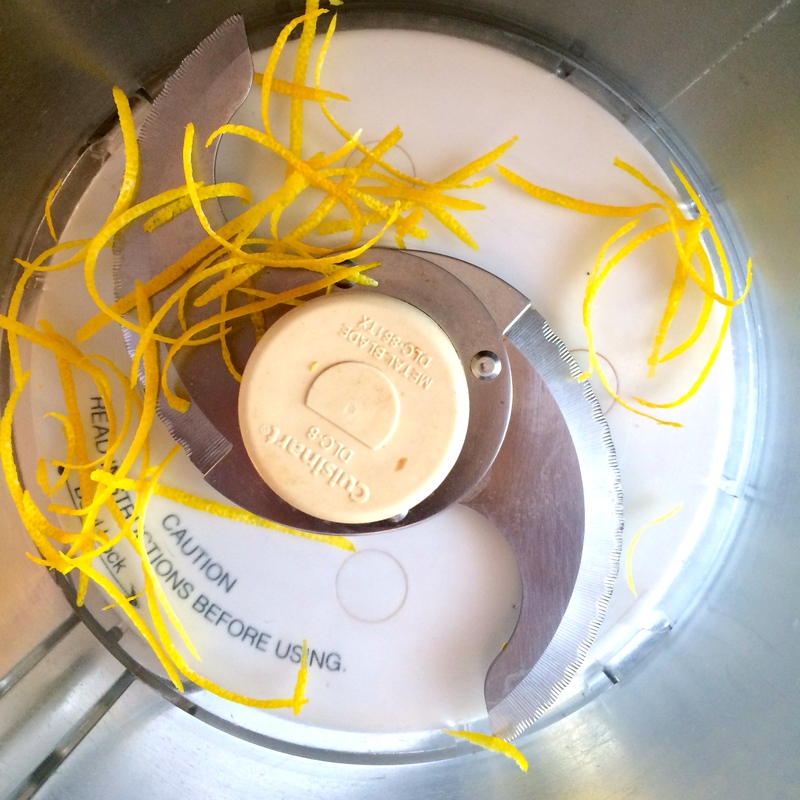 Meanwhile add the walnuts, lemon zest and juice, and salt to the work bowl of a food processor. Using two hands, squeeze the nettles dry of any excess liquid a clump at a time, then loosen each clump before adding it to the food processor with the other ingredients. Pulse the nettle mixture until finely chopped, stopping to scrape down the sides of the work bowl every now and then. Add the olive oil, then whirl the mixture until smooth and thick. (It should looks like green hummus.) Season to taste with additional salt, if necessary. Transfer the spread to an airtight container and refrigerate until ready to use, up to 2 weeks. When Pramod Thapa walked into the Sunburst Lodge at Sun Peaks Resort, the British Columbia ski hill I visited last weekend as part of a tasting tour of BC wine country, I recognized his gait immediately. He doesn’t have the typical cattywhompus walk of a kid with cerebral palsy; at 21, he’s been fortunate enough to progress into a more typical movement pattern that comes off as a young male swagger. Still, for someone familiar with CP, it’s evident. Yet Pramod also moves like a ski racer—shins pressing against the fronts of the boots when walking, using their natural support to avoid the awkwardness inherent to wearing ten pounds of metal and plastic on each foot. Pramod (pronounced “promo”) stopped short when the woman I was skiing with, Canadian ski racing legend Nancy Greene Raine, flagged him down. She realized that as the mother of a budding adaptive skier with cerebral palsy, I might want to meet him. Pramod perched one Lange boot on its heel—a typical racer’s resting posture—and shook my hand. When he started speaking, I realized that unlike Graham, he has a major speech impediment. He can speak well enough to communicate, but only if the listener has had, say, a few years’ experience tuning in to how the general population with cerebral palsy communicates. Pramod struggles to hug his mouth around vowels, and stumbles over consonants. Listening to him speak requires intense concentration, but he has a lot to say. As we huddled around the hot, cottony sticky buns the lodge pulls out of the oven mid-morning every day, Pramod and I talked about his ski racing history. About how after immigrating to Canada from Nepal as a kid, an adaptive ski instructor recognized that he might be the type to enjoy skiing. About how and whether we should go about transitioning Graham from a sit-ski guided by an instructor holding tethers to a sit-ski he guides himself using outriggers, which are like hefty ski poles with extra tiny skis at the bottoms. About how now, in a bid for the Canadian paralympic alpine team, Pramod is having to fight for the right to use kids’ skis, instead of the regulation (read: longer and heavier) men’s skis the other guys he competes against use. Pramod comes from a long line of sherpas. He can’t be more than 5’2”, and he must weigh 100 pounds soaking wet. I can’t imagine a person his size racing on the same skis my six-foot-something brother and father use. As we talked through the issue, he used his hands—hands seemingly unaffected by cerebral palsy—to describe the methods he’d been using to pressure the smaller skis around the turns in that day’s slalom and GS training. Fingers straight, hands tilting in parallel to mimic the skis beneath his feet, Pramod looked like any other ski racer talking shop. I realized that in a world where his body and his speech likely often prevent him from participating in a typical way, he has found a sport where he can use his hands to communicate the same way everyone else does. He’s found his sport. I also realized that when it comes to my own kid, it’s more important to me that he learns to love a sport than that he learns to love what I’ve long considered my sport. Which is why this weekend, along with something like a third of all Americans, we’ll be watching the Super Bowl. In an unpredictable combination of rare genetics, Graham has inherited a love of football. We don’t know how. We don’t know why. He “plays football” by knee-walking to and fro across the living room floor, hurtling his body against the couch or a chair or the dog occasionally, claiming touchdowns and wins according to rules we don’t understand in any way. But he loves it. So it seems like this year especially—when the Seattle Seahawks kick off their second consecutive Super Bowl—it makes sense to sit down and watch. And it makes sense for me to sit down and learn, the way Pramod’s parents are likely doing also, that it doesn’t matter what gets your kid fired up. What matters is that he’s fired up at all. I’d have photographed this recipe on a Seahawks jersey if I could, but we’re not big enough fans to have that sort of thing. 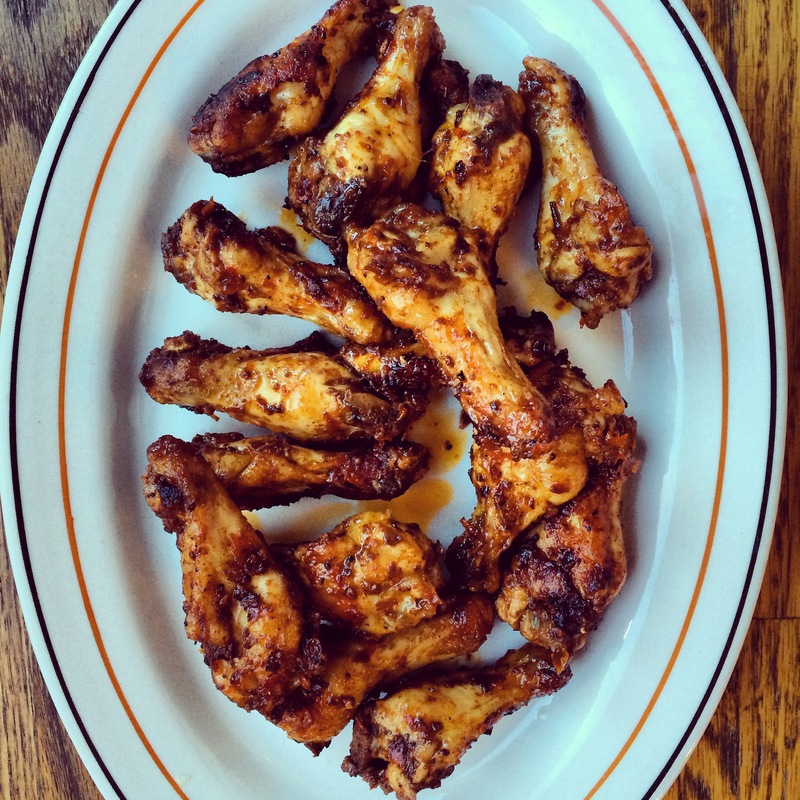 Nonetheless, when Super Bowl XLIX kicks off this weekend, we’ll be eating wings with millions of others, smothered, in our case, with butter and harissa. You can use a store-bought harissa for this, but the homemade kind from A Boat, a Whale and a Walrus works spectacularly. Note that each harissa will vary in spiciness, so you may need to adjust the heat to your own taste. I made this batch knowing there will be kids at our party on Sunday. Now get fired up, people. Two days ’til game time. Stir the melted butter and harissa together to blend. Divide the mixture between two large mixing bowls. Add the chicken pieces to one bowl, stir to coat the wings, then spread them out evenly on the prepared baking sheet. Roast the wings for about 20 minutes, or until the wings are bubbling and crisp at the edges. Transfer them to a paper towel-lined plate to drain for just a moment, then add them to the fresh bowl of harissa butter. Stir to coat the chicken, then transfer the chicken to a platter and shower with sea salt. Serve hot, with the yogurt on the side for dipping. It’s been a whirlwind, this year. At the start, when we knew 2014 would bring surgeries and leg casting and umpteen hours of therapy for 5-year-old Graham (“FIVE AND A HALF,” he’d scream), I’ll admit I wasn’t excited. I just wanted it to be over. But a few Friday nights ago, Graham walked right across the living room floor. In our house, with no physical therapist in sight. And then he walked around the first floor, in the little circle you can make when you leave the dining room to get something in the kitchen, but forget it’s really in the office, then somehow make it back to the dining room without losing your mind. And then he did it again, over and over, giggling uncontrollably. And then he fell with control, which was really the most significant thing. My husband and I danced around him the entire time, hands on sharp corners, ready for the inevitable crash. It never came. He just walked and walked, like it was a game, until he decided he was done. It was a game—a game he suddenly seemed to know he might someday win. I wrote a friend with our holiday YouTube video recently, which chronicles how far Graham has come this year. She has a kiddo in a similar position with cerebral palsy, albeit much younger. “Tell me M will be able to pull to stand one day,” my friend pleaded. Her email exuded the same dangerous desperation I’ve felt so many times; waiting for the walking is wanting good strawberries in winter and healthy news from a doctor and the fat college envelope. But it’s all those feelings rolled into a bracing sweet-and-sour moment that pops up a thousand times a day, over and over, day after day. I said once that having a child with cerebral palsy isn’t disappointing, it’s disorienting, and that still holds true. But suddenly I’m much less dizzy. Suddenly, that persistent moment—the wanting moment—matters less and less. It must have happened when we weren’t looking. Like fall does, when you’re busy looking at the things that happen in the fall, or, in my case, like a lupus flare does, when you’re busy doing the things you can do when you’re healthy. Here’s a recipe that happens almost when you’re not looking, from Passionate Nutrition, which comes out next week. It’s not walking, but it’s still quite spiffy–a scoop of this and that, all whirled up into an easy dip that I package in small containers to tote around town for snacking when I’m on the go (think crackers, cucumbers, and carrots). It’s an intriguing thing to set out for guests, because few people associate kimchi with anything besides Korean food, and it’s also a great way to get a little dose of healthy bacteria into your body every day. And—the most shocking news of all—Graham likes it. On crackers, spread all the way to the corners, eaten off a cutting board that’s seen three generations of haphazard snacks. Bring on the New Year, people. You never know what might happen. But at least you’ll know you’ll have a snack. 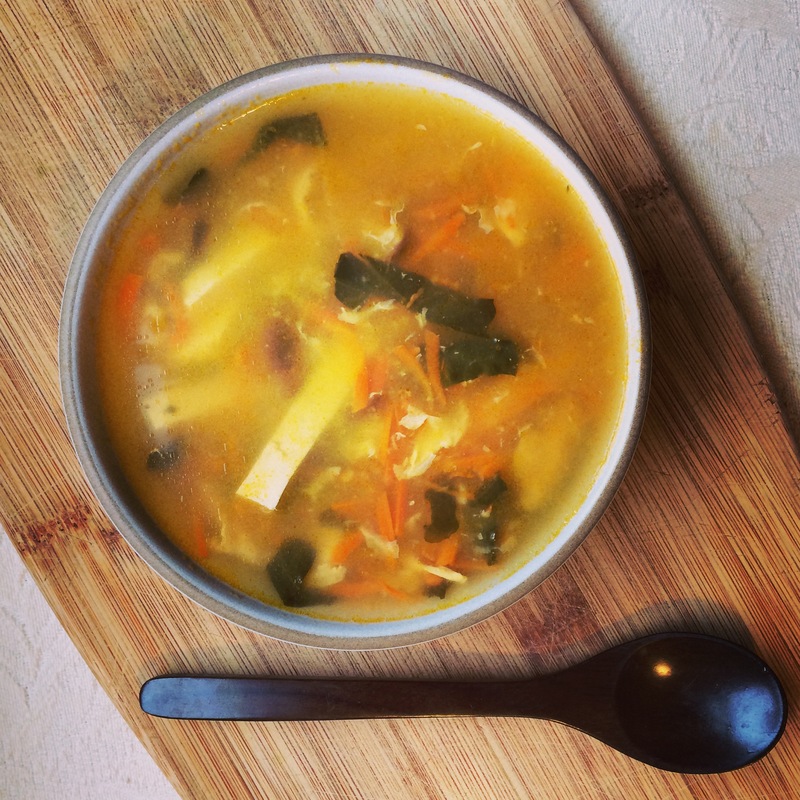 Not everyone likes kimchi straight, which is why when I help people start incorporating it into their diet, I often give it a little bit of a disguise. Blended into cream cheese, it makes a dip as addictive as the packaged soup mix dips of our youth. If you don’t have a food processor, just mash all the ingredients together with a fork. It won’t be as smooth, but it’s just as effective. Since this travels well (and tastes great at room temperature), it’s a good go-to snack to leave in the fridge at work or bring on trips. In the work bowl of a food processor, pulse the cream cheese, kimchi, and salt until smooth. Serve with the vegetables or transfer to a sealable container and refrigerate for up to 2 months. Add 1/2 cup cream and use as a dip for artichokes or a sauce for grilled chicken or salmon. *(c)2014 By Jennifer Adler with Jess Thomson. All rights reserved. Excerpted from Passionate Nutrition: A Guide to Using Food as Medicine from a Nutritionist Who Healed Herself from the Insider Out by permission of Sasquatch Books. If I could rewrite Thanksgiving tradition to include something a little more convenient and versatile than stuffing—a more colorful, more nutritious mixture of ingredients that really did stay perky overnight—it might look something like this fallish grain salad. Spiked with lemon and rounded with olive oil, it’s a colorful hodgepodge that comes together in about 20 minutes and passes as almost anything in my kitchen: as lunch on its own, as a bed for grilled tuna or roasted chicken, or as a nest for a poached egg in the morning. It’s wonderful warm, but equally delicious at room temperature, when the more subtle flavors of the parsley and pecans shine a bit brighter. Of course, if this were served in place of stuffing at Thanksgiving, there would be gravy, and while this salad is many things, I don’t imagine it making friends well with gravy. Which is why someday soon, I will make both. Note: You can toast the pecans on a baking sheet at 350 degrees F until sizzling and a shade darker, about 10 minutes, but in a rush I toast them by simply cooking them in the microwave for a minute or two. In a small saucepan, bring the stock to a boil over high heat. Add the quinoa and 1/2 teaspoon salt, stir to blend, then reduce the heat to low and cook, covered, until the quinoa has absorbed all the liquid, 12 to 15 minutes, stirring just once or twice during cooking. Set aside. Heat a large skillet over medium heat. Add 1 tablespoon of the olive oil, then the chopped radicchio. Season the radicchio with salt, then cook, stirring occasionally, until the radicchio softens, about 5 minutes. Add the lemon zest and the juice of half the lemon and cook, stirring, for one minute more. Transfer the quinoa to a large bowl or serving plate. 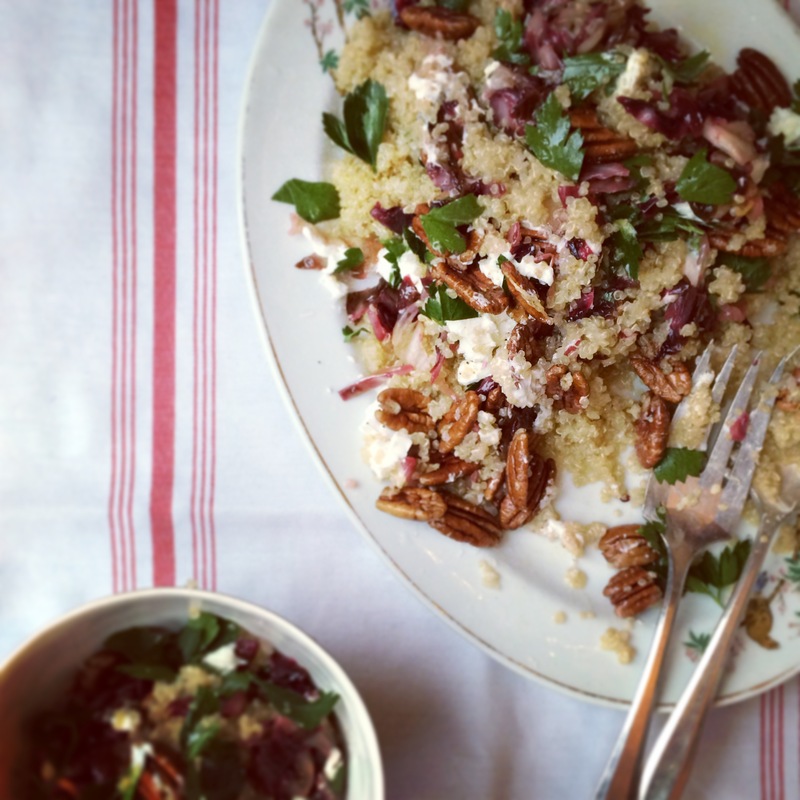 Layer on the pecans, parsley, goat cheese, and cooked radicchio. Drizzle with the remaining 1/4 cup olive oil, the juice of the remaining 1/2 lemon, and additional salt (and pepper, if desired) to taste, and toss all the ingredients together a few times. Serve warm or at room temperature. The salad keeps well, covered in the refrigerator, up to 3 days.